UPDATE 4/4/2019: After a few months of flawless operation, I woke up this morning to find that our Orbi had completely reset to unknown values. I RESET it but I still could not get into the system. A lot of effort later, I finally got it back and setup. Take caution buying this as it may go bonkers at any moment. 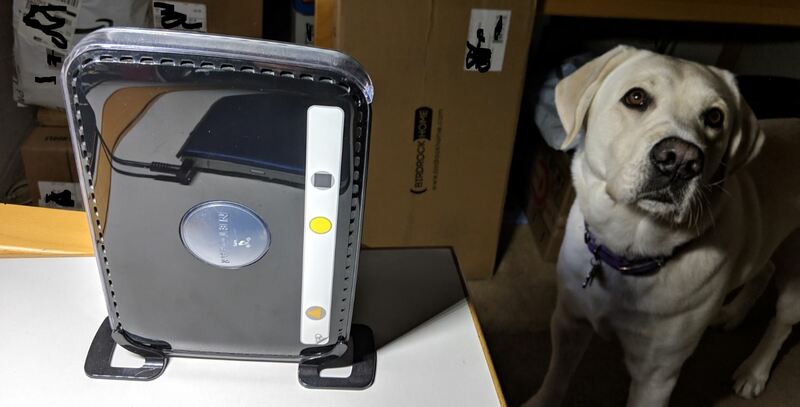 Our old ‘old reliable” Netgear WiFi router (see the pic with Blaze) was at least 10 years old. It could no longer hold a high speed connection which required a reboot to get back. And it was slow as molasses compared to our Comcast Internet speed. The time was approaching when a new WiFi router was needed. Lori and I were cruising Costco one day when we spotted the Orbi WiFi router on sale. BUT…..wait…..why are there two routers in the box? Reading the box as best we could in the crowd of people, it seems like the Orbi on sale was a “meshed WiFi router” that would provide coverage over a larger footprint when meshed with a satellite device. This is great for people with large houses or a castle, but, we only have 1895 sq feet, all on one level. My only, out-of-the-ordinary, need is in the backyard where Blaze and I telecommute, luckily that location is close to our old router and the WiFi force is strong there. Covering our telecommuting location should be easy for a new router. 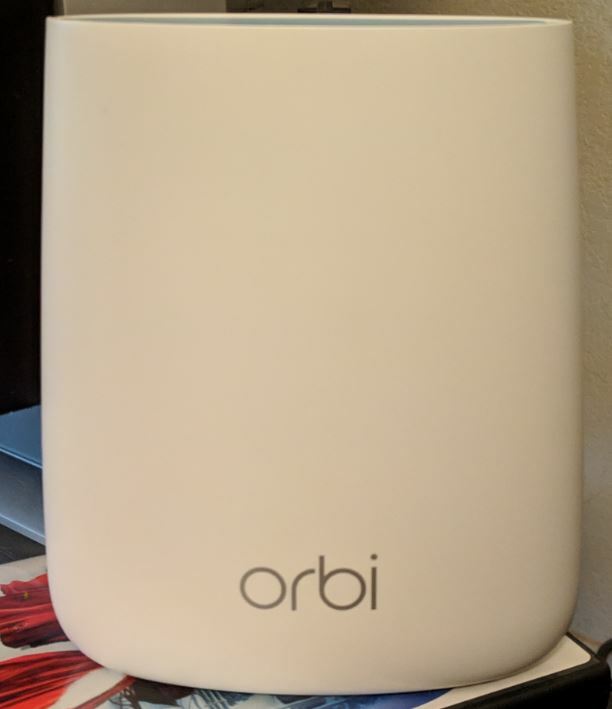 Looking at other WiFi router options, we found out that the Orbi fits the bill for us, and that it works with only one router. Yippee! Lori put in an order to Santa for the RBR20 Orbi WiFi router for Christmas 2018. It arrived with just a bit of soot on it from the chimney. Let’s give it a whirl. The Orbi is nicely designed, attractive, and compact. 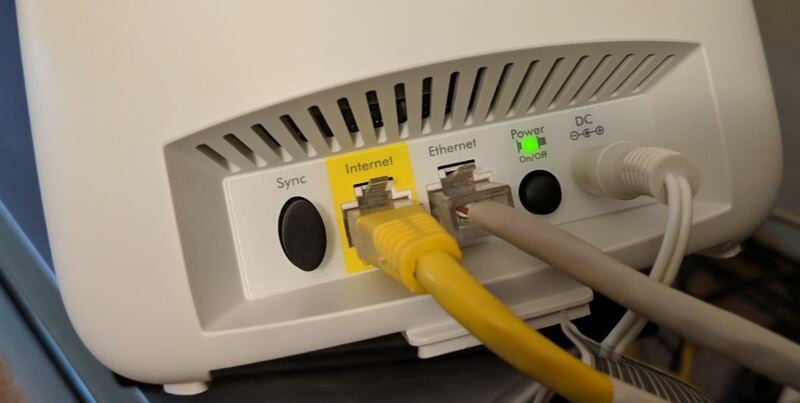 In fact, it fits right in the same spot that “old reliable” fit and where the existing RJ-45 network connections for the Sony Blu-Ray player and the Arlo Pro Security Cameras are. Power is there too. All I needed to do now was connect the Orbi to our Netgear Cable Modem, via the yellow cable, and the Orbi was physically ready to go. Reading (well. not really) the start-up guide, I found out that I needed to get an account set-up with Netgear, download an app to control the Orbi, then point my Pixel 3 XL at the supplied QR code to get the Orbi set-up with an initial network name and password (given to us on the Orbi) so I could get into the Orbi to configure it with our own network name and password. Opening the app after the QR code did it’s thing, I was able to configure the Orbi. Here are a few screen shots. 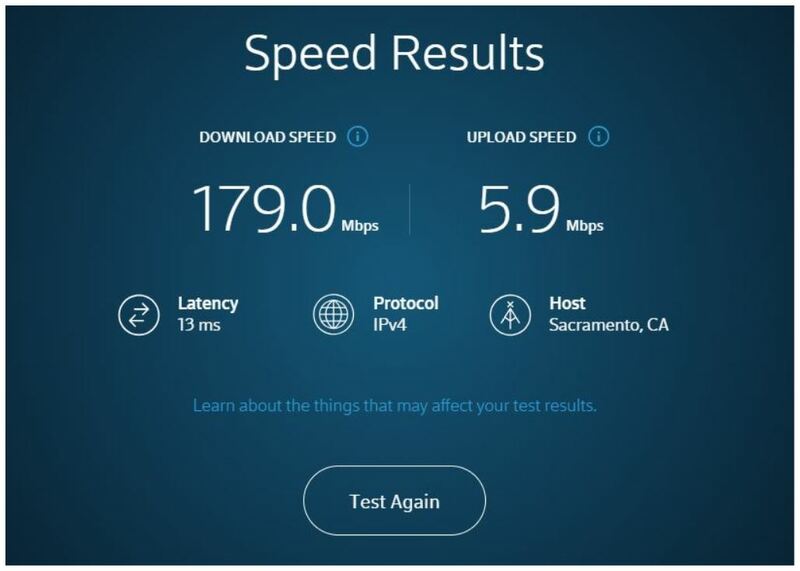 With everything working, I did a couple of speed tests. Wow! 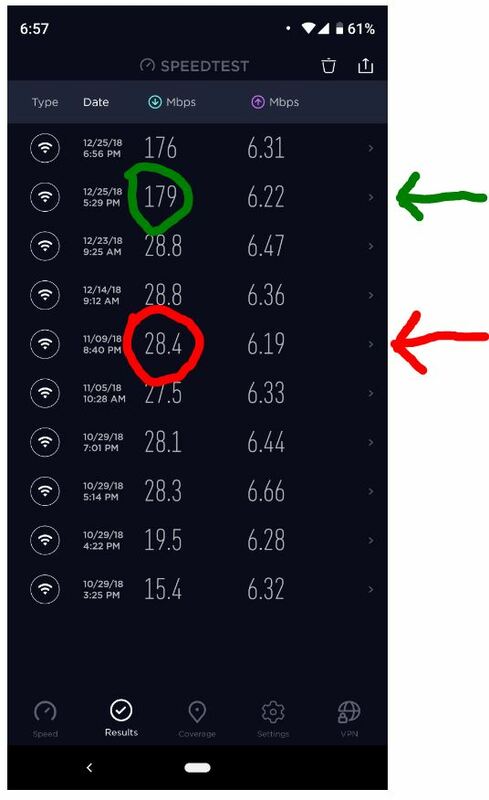 My WiFi connection speed increased by more than 6 times. Here are a few screen shots. Pixel 3 XL (before Orbi in red, after Orbi in green)!!!! The Orbi has been working since Christmas Day 2018. So far, it has been reliable, in fact, flawless. 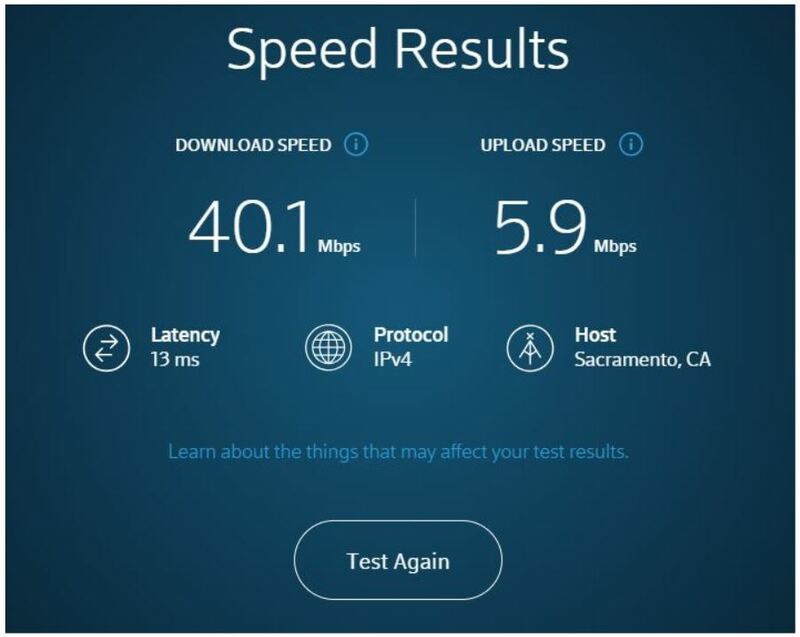 Time will tell, however, how reliable it will be long term, but, judging by our 10 year old old Netgear WiFi router, and our 1 year old Netgear Arlo Pro, we fully expect to be in for a long run of very high speed WiFi connectivity.